The Museum of Contemporary Art, Chicago (MCA), recently opened Karen Kilimnik from the Philadelphia Institute for Contemporary Art (ICA) on February 23rd and will be open until June 8th. The show opened to heated debate in certain quarters, and received a poor review in the Chicago Tribune, which can be read here. What is it about this show that has sparked such heated debate and is Kilimnik an artist unworthy of attention as some would have us believe? After reading much about Kilimnik I decided to investigate the show for myself, bracing myself for the worst. The Kilimnik show replaces one side of the Collection Highlights exhibit on the top floor of the MCA. Upon first entering the “scatter-piece” The Hellfire Club Episode of the Avengers (1989) is, well, strewn around. This piece establishes some basic themes and methods throughout the rest of the exhibit: perceptions of glamor and fantasy, the use of assemblage and installation, and a marked confusion of fantasy and reality. The bulk of the exhibition is found next in the long, wing gallery. Prior to visiting the exhibit I had read several reviews and expected to see nothing but paintings, the objects of much scorn. 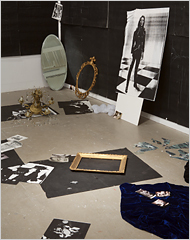 However, the work in this room showed a range of practice from assemblage to drawing to photography and video, with Kilimnik often incorporating unusual media to suit her purpose. Wondering where the hated paintings were I took in the apparently ignored output of Kilimnik, the work that wasn’t painting.While it has been hard for some to discern the thematic content in Kilimnik’s work, in the main gallery of the exhibition they emerged clearly. The fascination with with glamor and beauty in general and especially related to celebrity, and typical (almost stereotypical) girlhood interests like ballet, fashion, fixations on “it” boys and imagination. These themes surfaced most overtly through both the drawings and installations. A fake dinner party with the pink panther, illustrated fantasy stories about being an internationally famous Russian ballerina or a child who never became a model, all concealing more than a hint of the macabre. However the most interesting theme that presented itself was that of an underlying violence and the methods of dealing with trauma resulting from it. Most poignant in this respect was I Don’t Like Mondays, the Boomtown Rats, Shooting Spree or Schoolyard Massacre (1991), a scatter piece that featured target silhouettes, bullseyes, chicken wire and a toy gun. I don’t think that this piece was intended as a memorial to school violence but as a reaction to it. The toy gun is a mainstay of children’s play but placed in this context the boundary between violent fantasy and reality is challenged. The haunting unreality of children committing murder is underscored by the artifice of the materials displayed. Plastic guns and flimsy targets belie the reality of our increasingly violent times. The conscious artifice of the “bleeding” holes in the wall echoes the violent fantasy drawing of children but also its distance from reality. In this way the reality of violence has been repressed into an unreal, dreamlike state, the end product of a mental defense mechanism. The themes of repression and violence was continued in other works. In the video gallery the 1989 film Heathers, a film about students plotting to murder their classmates and ultimately trying to blow up the high school, is stretched to six hours. Snow was a repeated motif in many images and is appropriate: snow whitens, brightens, covers and dulls its surroundings. Snow covers up ugliness. In The Lion, the Witch and the Wardrobe the White Witch suspends the land of Narnia in eternal winter, similarly Kilimnik uses snow and has a professed interest in witchcraft (another topic all together). In photographs showing street-level entries to houses Kilimnik added white acrylic paint the images to transform them in a quiet snow bound scenes. Any unpleasantness in the image of the house is repressed through the addition of snow. Another photograph, contained within the red room in the modern Architecture (2007), depicted a dead squirrel on the street with the title Just Resting. This indicates the general way trauma is denied, death does not exist, only a deep sleep like Snow White (another frequent allusion of Kilimnik’s). Likewise, the scatter-piece Smallpox (1991) was totally hidden out-of-sight behind the cube structure for the red room. . . Containing fake blood, powder and the kinds beauty marks that were used to conceal the physical signs of the disease, this piece overtly hinted at covering up a trauma, this time through physical means. While much has been made over the paintings in the red room. . . I don’t believe I shall address them at all, at least not now. Criticisms of the paintings seems more based on the fact that someone has trespassed onto the sacred ground of oil-on-canvas than any criticisms of substance. My point here has been to draw out themes in Kilimnik’s art that others have claimed don’t exist at all and to show that Kilimnik’s painting is only one part of her varied output. If anyone has anything constructive to add about the paintings or these themes I would welcome those comments. Finally, much has been made of Kilimnik at the MCA and my fears that it would veer close to the tendencies of certain so-called Young British Artists were assuaged. I was disappointed to miss the soundtracks that accompany both I Hate Mondays. . . and The Hellfire Club. . . on my first trip and then several weeks later they were still silent, with the guards clueless as usual about why the sound was off. If an artist mixes a soundtrack or chooses a certain song to accompany the display of a certain artwork then it should be included or else it seems that one is doing a disservice to the artist and artwork. The MCA should fix this problem.